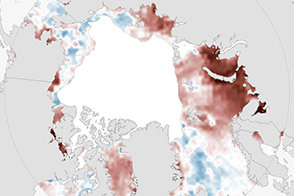 It drains a watershed that spans eight countries and nearly 1.6 million square kilometers (600,000 square miles). The Zambezi (also Zambeze) is the fourth largest river in Africa, and the largest east-flowing waterway. From headwaters in Zambia, it rolls across 2,574 kilometers (1,599 miles) of the south-central African plateau before pouring water and sediment into the Indian Ocean through a vast delta in Mozambique. The Operational Land Imager on the Landsat 8 satellite acquired this natural-color image of the Zambezi Delta on August 29, 2013. 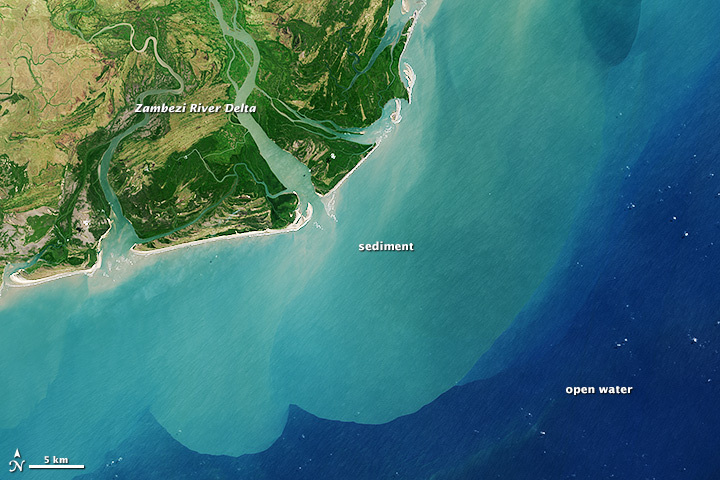 Sandbars and barrier spits stretch across the mouths of the delta, and suspended sediment extends tens of kilometers out into the sea. 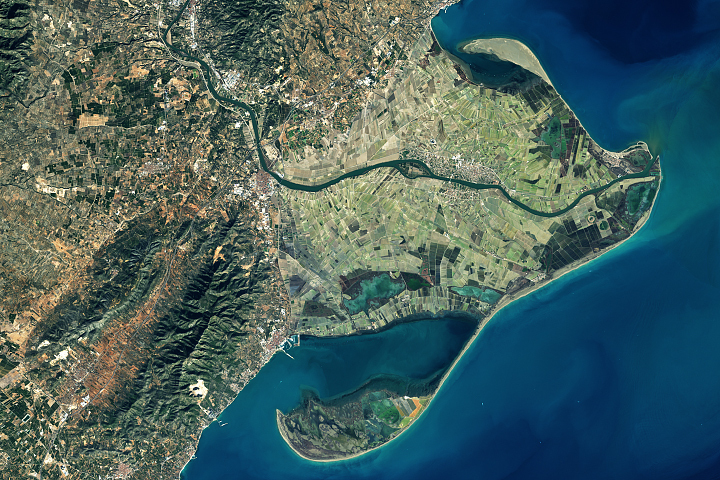 The sandy outflow turns the coastal waters to a milky blue-green compared to the deep blue of open water in the Indian Ocean. The Zambezi Delta includes 230 kilometers of coastline fronting 18,000 square kilometers (7,00 square miles) of swamps, floodplains, and even savannahs (inland). The area has long been prized by subsistence fishermen and farmers, who find fertile ground for crops like sugar and fertile waters for prawns and fish. Two species of endangered cranes and one of the largest concentration of buffalo in Africa—among many other species of wildlife—have found a haven in this internationally recognized wetland. 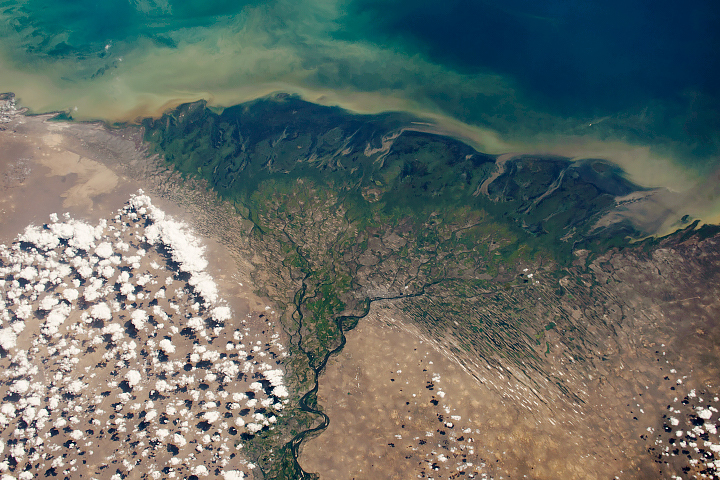 However, the past six decades have brought great changes to the Zambezi Delta, which used to pour more water and sediment off of the continent. Hydropower dams upstream—most prominently, the Kariba and the Cahora Bassa—greatly reduce river flows during the wet season; they also trap sediments that would otherwise flow downstream. The result has been less water reaching the delta and the floodplains, which rely on pulses of nutrients and sediments from annual (and mostly benign) natural flooding. World Rivers Review , via International Rivers (2006) Restoring the Zambezi: Can Dams Play a Role? Accessed December 10, 2013. 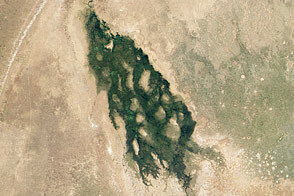 NASA Earth Observatory (2001, March 11) Flooded Zambeze River. Richard Beilfuss, International Crane Foundation (2013) Environmental Flows and Restoration of the Zambezi Delta, Mozambique (PDF) World Delta Dialogues. Accessed December 10, 2013. The Travel Guide to Victoria Falls The Zambezi River. Accessed December 10, 2013. The Ramsar Convention on Wetlands The Annotated Ramsar List: Mozambique. Accessed December 10, 2013. 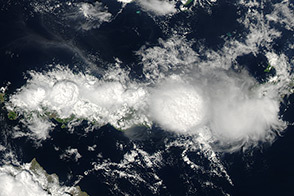 NASA Earth Observatory images by Robert Simmon, using Landsat 8 data from the USGS Earth Explorer. Caption by Mike Carlowicz. One of Africa’s largest river systems reaches the Indian Ocean with less water and sediment today than in the past.